As yesterday was International Francophonie Day and UN French Language Day, we thought we'd take a look at the history of the French speaking world. While we covered the French language in its own language profile way back in 2012, we barely touched upon the history of a language that is often considered to be the most beautiful in the world and the "language of love". Prior to the arrival of the Romans in what we know now as France, a Celtic language known as Gaulish was spoken by the Gauls, Celtic ancestors of the French. The Gauls are popular in France as a symbol of French national identity, especially in the popular comic Asterix, known in full in France as Astérix le Gaulois, referring directly to his Gaulish heritage. Despite the plucky nature of the Gauls as shown in Asterix, they were indeed conquered by the Romans, along with the Belgae, the Iberians, and the Ligures. As they did everywhere they conquered, the Romans brought the Latin language with them. The arrival of Latin in Gaul marked a massive linguistic change in what we now know as France. Like the other Romance languages, French is derived from Vulgar Latin, as opposed to Classical Latin. Vulgar Latin is a generic term for the sociolect of Latin that was spoken across the length and breadth of the Roman Empire. 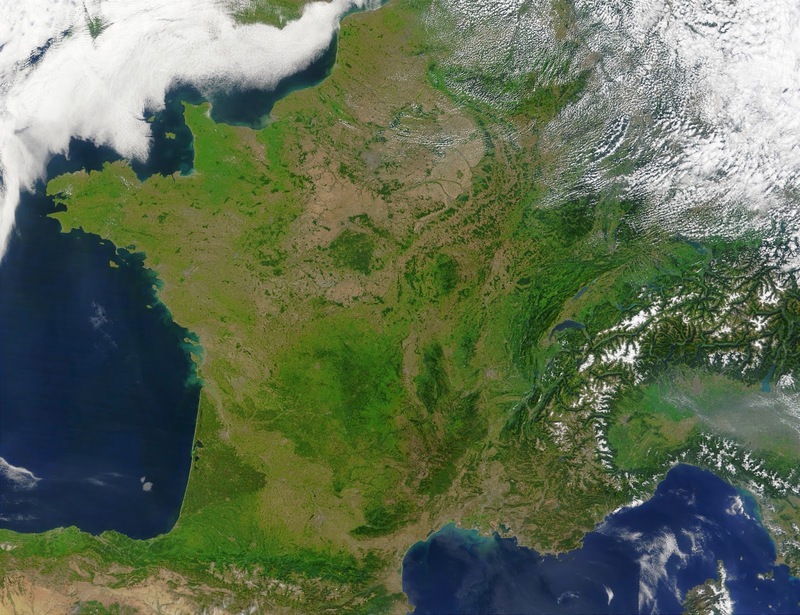 France, the home of Modern French, as seen from space. The arrival of the Franks, a Germanic tribe, in the 3rd century had a profound effect on what would later become Modern French. Add to that the Alemanni, Burgundians, and Visigoths, who arrived alongside the Franks drastically changing the vowel system and syntax of the language as it was spoken then. Another important point of the history of the French language was the unification of Normandy and the Kingdom of France in the 13th century. This led to the addition of many words of Scandinavian origin to the lexicon of Old French via the Norman language. Middle French was adopted by the Kingdom of France as the official language, replacing Latin and other regional languages including the Occitan and Oïl languages. By the 17th century, French literature was paving the way for French prescriptivism, establishing what is now known as Classical French and evolving into Modern French. It was Modern French that would become a lasting legacy of French colonialism. While we won't go into the vast and complicated history of French colonialism, it's safe to say that it is the reason why French is spoken in so many countries around the world, particularly across Africa.